My cute British grandparents used to make strawberry rhubarb pie (and when I say 'make' I really mean bought and put in the oven.) So when I found frozen rhubarb at Central Market I grabbed a bag, not sure what I would do with it. 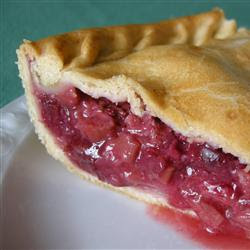 I didn't have any strawberries but did a little research and found that rhubarb can be a pie filling all on its own! If you've never had rhubarb, it's kind of a mix between a cherry and a strawberry... Kind of. Spray non-stick spray on pie plate. Lay bottom pie pastry over pie plate. Combine sugar and flour. Splrinkle 1/4 of it over pastry in pie plate. heap rhubarb over this mixture. Sprinkle remaining sugar and flour over top. Dot with small pieces of butter. Cover with top crust. Pinch the edges of the pastries together to seal the edge of the pie. Place pie on lowest rack in over. Bake for 15 minutes. Reduce temperature to 350 degrees, and continue to bake for 40 to 45 minutes.